BASSETERRE, St. Kitts – A special airing on ZIZ TV (Channel 5 in St. Kitts and 98 in Nevis) of the National Assembly Elections Amendment Bill 2009 tabled in Parliament July 3, 2009, by former prime minister and now-leader of the Opposition, the Right Honourable Dr. Denzil Douglas, will take place tonight at 8 p.m. and Wednesday at 10 a.m. In his presentation on the amendment bill, Douglas passionately defended the Constitution, where members of Parliament (elected and appointed) who hold dual citizenship are disqualified from representing the people in Parliament. 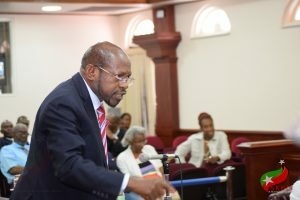 The St. Kitts and Nevis’ leader of the Opposition and parliamentary representative for St. Christopher Six has now finally admitted in a sworn affidavit filed in the High Court Registry Feb. 21 that he filled out an application form and was issued with a diplomatic passport of the Commonwealth of Dominica, upon which he has used to travel. The government has now challenged the leader of the Opposition in court regarding his eligibility to serve as a member of Parliament while being the holder of a diplomatic passport of the Commonwealth of Dominica, which identifies his nationality as Dominican.